The taxi-ride from the central West Bank to Jericho is a memorable experience, not least thanks to our effervescent Palestinian taxi-driver, Dudu, who sings between jokes and communicating the nuts and bolts of the Palestinian situation. In little more than an hour his aging car twists down down down to 270m below sea-level, leaving behind rolling limestone hills peppered with olive trees to enter stark pink and yellow desert. We pass the turn-off to the Palestinian village of Duma, tragically known for the settler attack last July, when an entire Palestinian family was firebombed as they slept. Soon, only the odd palm tree alleviates the desolate, rocky contours, though settlement after illegal Israeli settlement crowns the hilltops. Our ears pop as we emerge from the stony Samarian mountains. The scenery would seem evocatively Biblical were it not for the industrial clutter of Ma’ale Efrayim, a clearly prosperous settlement founded in 1978 on land seized by military order. The immaculate, tree-studded access road says it all. A strip of bulky polytunnels then a vast palm grove unfolds – source of those luscious medjoul dates & abundant underground water. Since the 1967 invasion, Jordan Valley produce is controlled by Israeli settlements (barely 5% of this fertile land is farmed by Palestinians), though Jericho, returned to full Palestinian control in 1994, does produce its own exquisite fruit. This is something to bear in mind in Europe when buying medjoul dates – check the origin: if it says ‘Jordan Valley’ then it is from an Israeli settlement. Then the moment a herd of sheep straggles into view, we know we’re back in Palestinian territory (yes, kebabs!) and the road slices through Al Ojer, the only Palestinian village we’ve seen since leaving Huwwara. Yes please, so we enter a disordered fairground of kitsch and colour as well as beautiful handblown glass and a nursery garden of locally grown plants – to be met by Taysir, the cheery owner (below). “Come in come in!” he beams. So the three of us are seated for coffee, short and strong as an ox. The wind blows dry and the temperature has leaped at least 10 degrees. Taysir turns out to be a Bedouin whose grandfather originated from Saudi Arabia. Now 50, he can just about remember when there was no water or electricity, and his family lived in tents. “:A third of us still do” he adds. We don’t go into the plight of the West Bank’s 50,000 Bedouin under Israeli occupation – demolition of their encampments and forced eviction is a fraught, ongoing issue. Dudu lays on his chat and easy charm and the pair are soon laughing away as if they’d known each other for years. That’s so Palestinian, the result of huge families which nurture effortless communication and affection. Beyond more moonscape, we finally enter Jericho, a sprawling oasis town of about 18,000 people at the base of the towering Mount of Temptation, or Jabal Quruntul. Jericho’s name may be legendary, but after a bit of research, I discover its Biblical ‘history’ is pure fantasy. Yet it’s been inhabited non-stop since 9,000BCE (including an interval when it belonged to Cleopatra), making it the oldest inhabited city on earth while also claiming to be the lowest point (disputable!). Hisham’s Palace is one of several major historical sights on Jericho’s map. As it’s sizzling and midday, Mel and I decide, like true English women, to borrow guesthouse bikes to peddle 3km to see it, as by now Dudu has returned to his village up in the West Bank. They’re rusty as hell, brake-less and gear-less, so it’s a hot slog to reach the ruins. Despite the beguiling history, it’s impossible to forget the present; Israeli fighter jets roar overhead surveying the border with Jordan, a mere 8km away. Jericho’s quirky quality continues when, on our way back, we jam on our non-existent brakes outside an inviting-looking restaurant: Syraan, at the Ain Es-Sultan. This turns out to be a natural spring transformed into a shaded bathing pool, from where the spring water is channeled inside a restaurant. Wow! Dripping from the heat, we’re shown to the only table in the aquatic section of this cool stone setting. Here, with our bare feet chilling in gentle eddies, we devour luscious hummus, a huge fattoush salad and a plate of kibbeh. Bliss. Then, just as we’re leaving, we spot another mirage: four carabinieri, suavely Italian in their well-cut uniforms and cool shades. Though pleased to meet someone who can speak their linguaggio they are coyly cagey about what they’re up to. Finally they admit to training Palestinian police, an EU initiative – not quite sure why it’s so top secret. Back at our equally offbeat guesthouse, Auberginn, our talkative host Essair introduces us to two resident donkeys and a chicken coop art gallery. Stranger and stranger – Lewis Carroll would have felt at home. The huge garden of fruit-trees and vegetable beds is all organic and that evening some choice veg morphs into a homemade soup. Essair tells us how Jericho has always been a traditional winter resort for the Palestinian aristocracy. I can believe it; when it’s freezing in Jerusalem and Bethlehem, that balmy low altitude, oasis greenery and fresh fruit and vegetables would be alluring – nor is the Dead Sea far. We choose to aim higher though, and later take the smart Austrian-built cable-car which whizzes us up Temptation Hill. Most of the gondolas are empty of course due to the ongoing tension. We swing over Tell es-Sultan, the remains of ancient Jericho, as well as houses and farms, before the structure of the mountainside monastery takes shape for our landing. Built in the late 19th century around a cave where, allegedly, Jesus received his first temptation, the church-monastery cantilevers dazzlingly from the cliff. You can just see it at the join of the hills in the pic below, wrapped around the rockface. Steep steps from a deserted café lead up to the inner sanctum which, it transpires, is now only inhabited by four monks. It’s always sad to see a lifeless monastery, in this case with 20 or so unused cells, though the structure itself is perfectly maintained, so someone is clearly still funding it. Inside the church a lone monk sits bent over a book in monastic silence, leaving us to climb to an upper floor to admire naif frescoes and spectacular views. Right in front, swifts and birds of prey circle dizzily. Fresh pomegranate juice at the café revives us, with a soundtrack of Quranic chants and distant rumbles of thunder. It’s not just political pressure that is building up. Downtown Jericho is a different matter entirely, buzzing with noise and life. On this hot Saturday night, the streets are festooned with LED lights, shiny cars and 4WDs cruise past, shops sell mountains of dates or giant, glittering chandeliers, men smoke shisha outside cafés while falafel sizzles and shwarma permeates the air. A breath of fresh air indeed. We sit outside a café and get through a jug of limoun bi nana, that addictive blend of iced lemon juice and mint, as we watch the spectacle. People are open and chatty and, being on the tourist trail, speak good English. Even the women look surprisingly emancipated. But there has to be one more incongruity which we find glinting under the fluo lights of a dilapidated petrol station: a creamy yellow, 1950s Ford Fairlane 500. Of course. 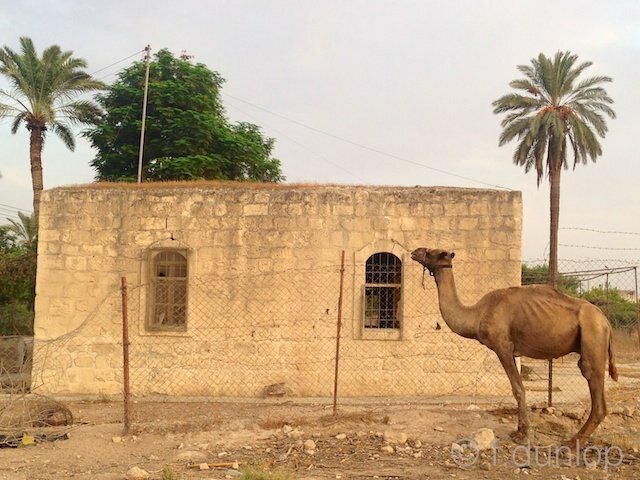 Where else in Palestine but Jericho?